I didn’t get to much crafting this week. Not sure why. Rick cleared out his closet and set some clothes aside to take to Goodwill. Looking at the bag I remembered I need buttons for the shirt I still want to make. So I thought it wouldn’t be too wasteful to take the buttons off one shirt and toss it out. I ended up cutting up several, both for buttons and as paint and craft rags. Some were a bit thread bare to send off anyway. I noticed the collar stays, and saved those too. Then I wondered how the crisp points on the collars are sewn. 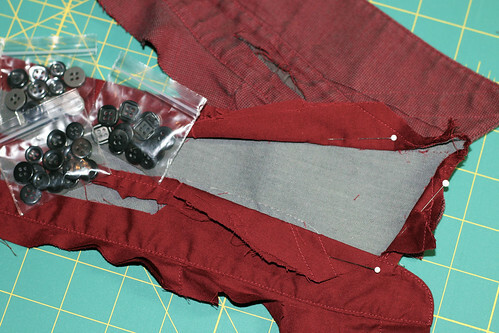 As I was picking and cutting it apart I noticed how the interfacing is done. It is in two layers. The first layer is bias and sewn into the seam around the collar. The second is on grain and cut away from the neck edge 1/4″ in back and only sewn in the seam allowance for an 1″ or so at center front. Also the neck band interfacing is cut on the bias. This technique is new to me, though it may be in some of the newer sewing books. The nice thing about cutting buttons from old shirts is that they come in sets with the matching little cuff placket buttons. Now I am stocked up on button sets and paint rags. I even cut a white shirt because the fabric seemed ideal for a pressing cloth. Now I just need to clear the cutting table to make the pattern adjustments and sew a collar like these. The double interlining may be why the collars on store bought shirts do not wear out as fast as on the shirts I make. This entry was posted on Wednesday, January 23rd, 2013 at 6:42 pm and is filed under Sewing. Tagged: Sewing. You can feed this entry. You can leave a response, or trackback from your own site. Brilliant idea to deconstruct and learn! I would have never thought of that.